Yes, that's right, folks! It's time for a brand new Simon Says Stamp Wednesday Challenge! This week we are ALL over the place! No, for reals, though... the theme is TRANSPORT IT! Yup. Planes, trains, and automobiles, my friends! If it transports stuff, we like it! The design team is using Simple Stories products this week. You don't have to use them to participate, but if you have some we would love to see how you rock them! I decided to go with lots of fun stickers for my card! This one was super easy to pull together and it's a fun one! The sentiment is stamped with the Be My Guest alphabet stamp set from Waffle Flower Crafts. I LOVE that font so much! Now it's YOUR turn! One lucky challenge participant is going to win a $50 voucher to the Simon Says Stamp Store! DUDE! You know you want that to be you and you can't win it if you aren't IN IT! So... get on that and stuff. I don't think to use stickers, but I love how your card came out, Jennifer - they give such a crisp look! 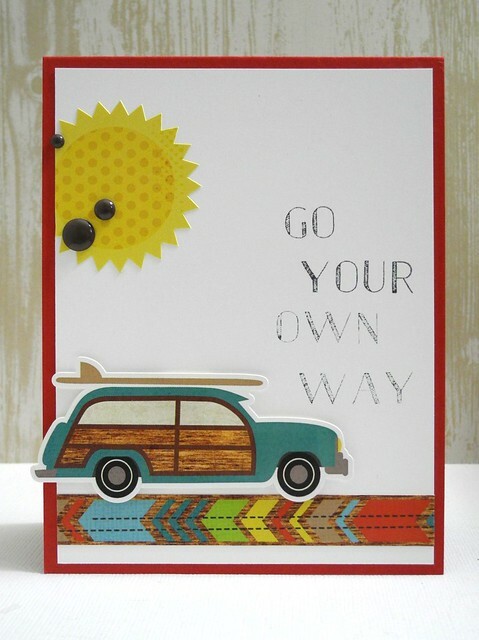 what a fun card.. i love that car..
Now I'm singing the song...and I want to go to the beach. Not to surf, mind you, but still! great card scene! Good stuff. Love me some woody wagon. 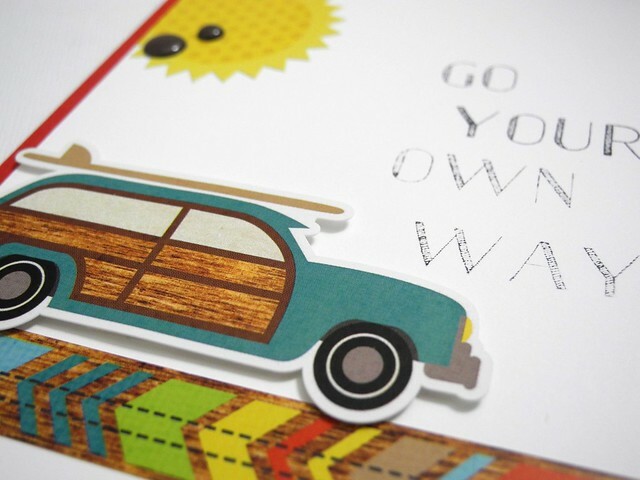 Fabulous card Jennifer, wonderful stickers and I love your car sat so neatly on that stunning 'road'!! Wow, it's a great card, Jennifer!!! Squeeeeeee!! This is adorable!! I love the song!!!! And that woody rocks!!!! Awesome card! Totally made my day! Brilliant, takes me back to my holiday with the surf boards on top of the car - wish I was there !